Alfreton Town head to Yorkshire tomorrow afternoon as we face Guiseley in the National League North, kick off at Nethermoor is 3pm. The Reds will be full of confidence after an outstanding performance last Saturday in a 2-1 win against league leaders Chorley. It was a performance full of grit, passion and desire and Alfreton finally got their rewards their effort deserved after previous games had seen good performances but no points. After falling behind to a Marcus Carver close finish, the game might have felt it was heading to be another home defeat and another case of what could have been for the Reds; but the second half was something to behold with the players putting their bodies on the line, pressing the leaders and creating chance after chance with no recognised striker on the pitch. Danny Clarke drew us level with a header which took a deflection in the box before nestling in the corner, then a minute later Danny O'Brien hit surely goal of the season with an unbeliveable volley from near 45 yards which looped over the keeper and into the corner. The two goals stunned Chorley who never recovered and we grabbed the three points deservedly and the result will certainly be something to build on heading into the upcoming run of games against sides below us in the table, it gives Alfreton the chance to start pushing towards the top half of the table after a result which showed that the side can match and beat the very best in the league. It certainly gives fans hope for the future with some outstanding results this season, with consistency being the common issue with the Reds unable to record winning runs in order to maintain any kind of play off push this season. However Saturday's result did show that Billy Heath's men can compete at the top end of the table. We head into tomorrow's fixture having won our last two games in all competitions, we will be looking to really string a run together now in the league with just two wins in our last nine in the National League North. Away form has been brilliant for the Reds, who sit in 8th place in the away form table. We have lost just two of our last six away outings in the league and that rises to seven in all competitions if we include the 4-2 win at Matlock in the DSC. Guiseley sit in 19th place in the table with 33 points from 30 games. The Lions are four points and four places below us but have played a game less, they are six points clear of Ashton United in the final relegation spot. Guiseley's playing record so far: P30, W6, D15, L9 - The hosts are draw specialists having drawn the most games out of any side in the league with 15. The hosts head into tomorrow off the back of three straight draws in the league, but they did beat Barnoldswick Town 4-3 in mid week in the West Riding County Cup. Guiseley are win-less in their last nine league games (D6, L3) with their last three points coming at Bradford PA back on the 1st January. Home form has been a huge struggle for the Lions who are currently ten league games without a win at home. Despite beating Cambridge United and Stourbridge in the FA Cup at Nethermoor, their last home win in the league came against Brackley way back in October. 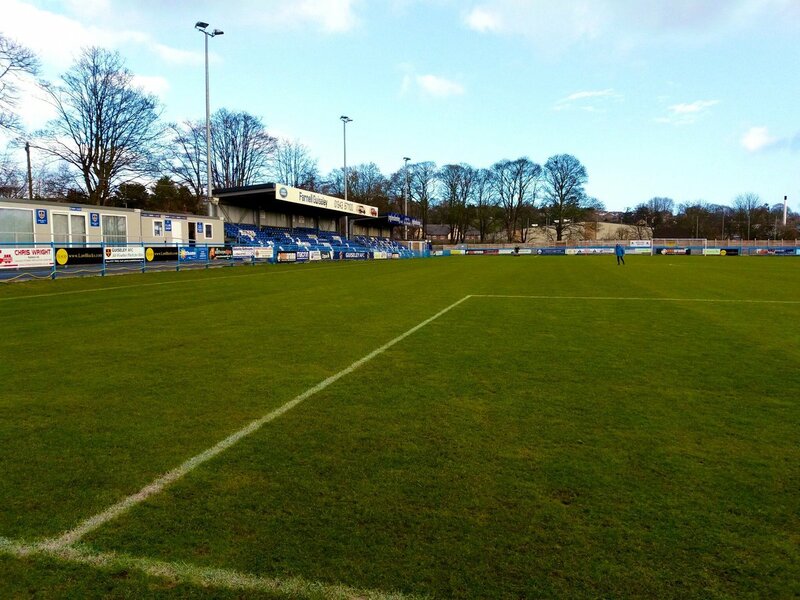 Nethermoor Park, Otley Road, Guiseley, Leeds, LS20 8BT. Reds can enter the ground and pay via gates located at three ends of the Stadium. Gates 1 and 2 are adjacent to the cricket club, Gates 3 and 4 adjacent to a small car park and Gates 5, 6, 7 and 8 are at the Railway End. Admission: Adults: £13, Concessions: £9, 11-18 Year-Olds: £5, Accompanied Under-11s: £1. Alfreton Town 0-1 Guiseley (Saturday 8th September 2018): Rowan Liburd's 11th minute strike sealed three points for the Lions and ended the Reds four game winning streak back in September. The goal came after a under-hit back pass and the Lions striker gladly took the chance to leave the Reds frustrated in a game which was mostly dominated by Billy Heath's men.